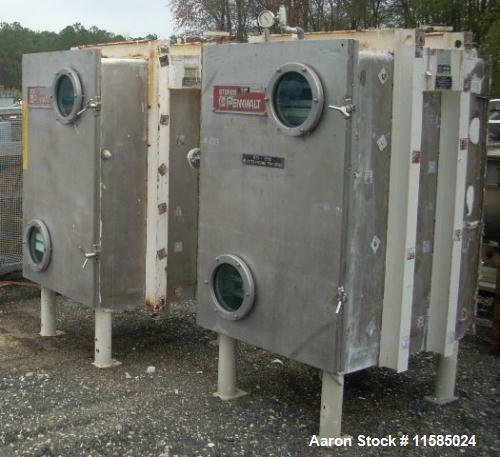 Below is Aaron's inventory of unused and used vacuum shelf dryers. If you are looking to sell your used vacuum shelf dryer submit a request online or contact Erik Eichert at 630-238-7480. 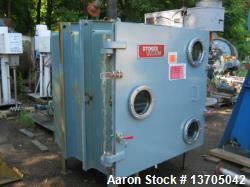 Used- Stokes Model 338-F15, Stainless Steel Vacuum Shelf Dryer. Used- APV Vacuum Cooler, Model Vacuum Cooler, 304 Stainless Steel. Used- 100 Square Foot, Stokes, Model 338-H-8 Vacuum Shelf Dryer. Sanitary stainless steel chamber. Rated full vacuum at 250 F, (8) 44" wide x 40" deep sanitary stainless steel jacketed shelves. Rated 50 PSI at 300 F. 4.625" clearance between shelves, internal number 4 polish, with Stokes Model 900-85-4 ( 43 sq. ft) surface condensor and receiver. 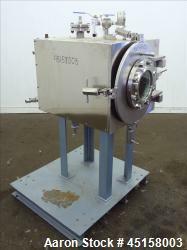 Hicks Hargreaves (Stokes) two stage liquid ring vacuum pump rated 70 CFM at 29" with vacuum ejector, with manuals. Built 1990. Last used in a pharmaceutical application. 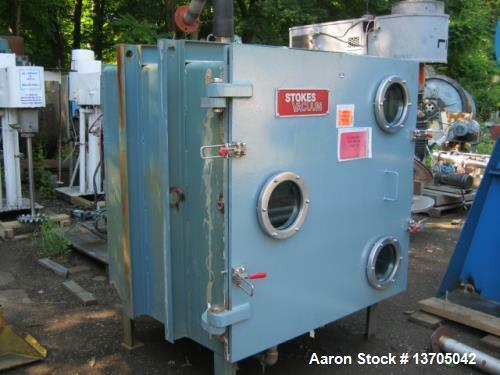 Used- Stokes Vacuum Shelf Dryer. Model 338-3. Approximately 30 square feet. (7) 24" wide x 36" deep x 1" thick stainless steel shelves, (6) usable, rated 50 psi at 300 degrees F. Chamber 30" x 39 1/2" x 41" deep rated vacuum at 200 deg F. Front hinged door with (2) sight glasses. 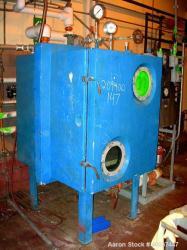 Includes a pump and heat exchanger skid. Mounted on 4 legs. 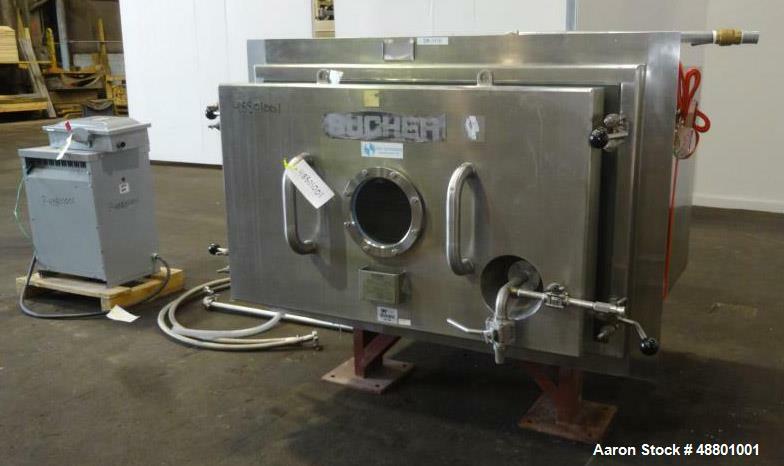 Used- Bucher Guyer Vacuum Shelf Dryer, Type VTS E1 3m2. Approximately 4 square meter (43 square feet). 316 Stainless steel and Halar coated. (4) Shelves 41-3/4" wide x 39-1/2" deep x 1" thick, rated -1/4 bar (-14.5/ 58 psi) at 140 degrees C, (284 F.). 316 Stainless steel and Halar coated chamber 45" long x 43-1/2" deep x 24" height rated -1 bar (-14.5 psi) at 140 degrees C, (284 F.). Front hinged door with sight glass. Mounted on 4 carbon steel legs. Serial# 2310.0017/1, built 1999. Includes Kinney vacuum pump, Model KTC-21, driven by a 1-1/2 hp, 3/60/208-230/460 volt, 1725 rpm motor, Aro diaphragm pump, Model 666100-362-C, 20 gallon expansion tank, Tool-Temp temperature controller, Model #TT-133 Basic, Serial# 99-04527-2, and a 30 kva transformer. 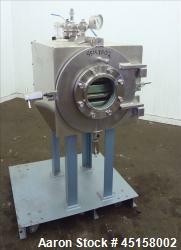 Used- Klein GHS Vakuumtechnik Vacuum Shelf Dryer, Model VTS5. Approximately 5 Square meter (53 Square Feet) Shelf Area. (5) Approximate 39-3/8" wide x 39-1/4" deep x 1/8" thick 316 stainless steel dimple jacketed shelves, rated 2.5 bar (36 psi) at 120 degrees C. (248 F), spaced approximate 4-5/8" apart. Internal chamber 41-3/4" x 28-1/4" tall x 41-1/4" deep rated -1 bar (vacuum) at 120 degrees C. (248 F). Hinged front hinged door with a sight glass. Mounted on 4 legs. 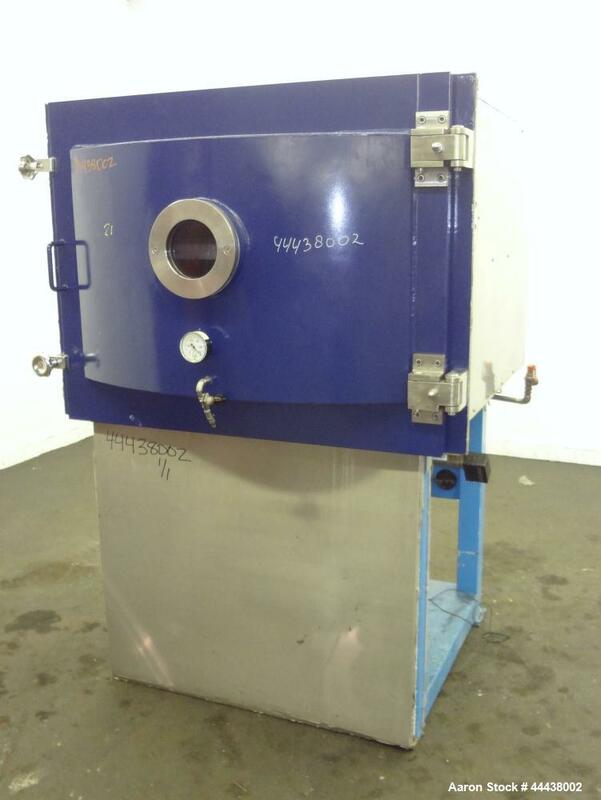 Used- United McGill Vacuum Shelf Dryer, Approximate 6 Square Feet, Model MD-1, 316L Stainless Steel. (3) 12" Wide x 24" deep x 1-3/8" thick usable cored shelves, rated 100 psi and Full Vacuum external. 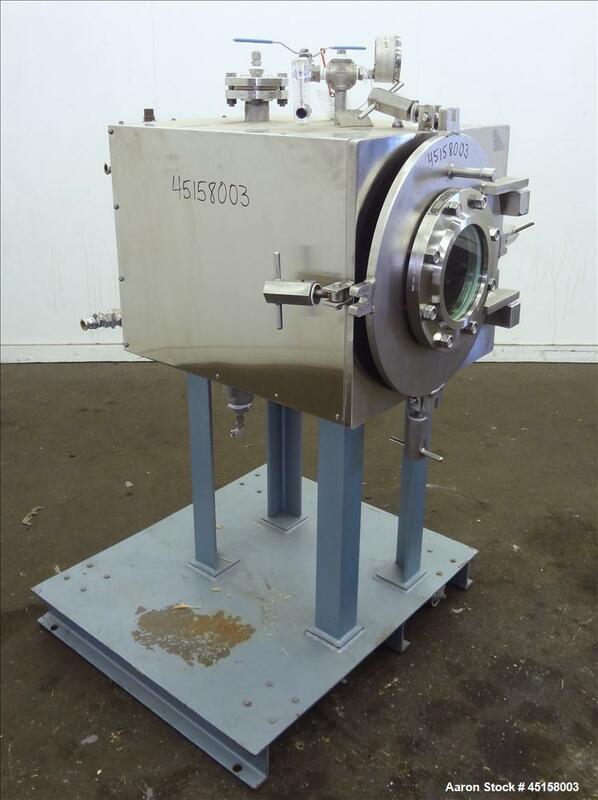 Chamber 17-1/2" Diameter x 25-1/2" deep, rated Full Vacuum, design temperature 350 degrees F. Hinged front door with an 8" sight glass. Mounted on 4 carbon steel legs, on a carbon steel skid. Serial# N-1533-1, built 1995. 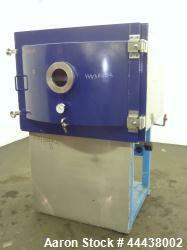 Used- United McGill Vacuum Shelf Dryer, Approximate 6 Square Feet, Model MD-1, 316 Stainless Steel. (3) 12" Wide x 24" deep x 1-3/8" thick usable cored shelves, rated 100 psi and Full Vacuum external. Chamber 17-1/2" Diameter x 25-1/2" deep, rated Full Vacuum, design temperature 350 degrees F. Hinged front door with an 8" sight glass. Mounted on 4 carbon steel legs, on a carbon steel skid. Serial# N-1533-1, built 1995. Used- Stokes Model 338-F15, Stainless Steel Vacuum Shelf Dryer. 90 square foot surface area. All contacts stainless steel including chamber, door and shelves. 15 shelves 24" wide x 36" deep, providing 2" clearance between. All shelves rated for 75 psi / full vacuum internal chamber at 650 degrees F. Chamber rated Vacuum at 200 degrees F. All shelves individually. National Board Stamped. Unit built 1980. 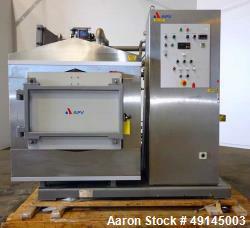 Used- APV Vacuum Cooler, Model Vacuum Cooler, 304 Stainless Steel. Chamber approximate 39-1/2" front to back; 33" left to right x 24" tall. Mains water at 3 cubic meters per hour, filtered air supply at 5.5 BAR. Hick liquid ring vacuum pump, type VHR 450, driven by 20 Hp, 3/60/48 volt, 1795 rpm motor. (1) Hick rotary piston blower, Model MB52, driven by a 9.1 hp, 3/60/480 volt, 3415 rpm motor. Control panel with Allen-Bradley ACS 300. Has (3) racks for shelves. Typical cooling cycle is from 88/86 to 30/28 degrees C. Mounted on a painted carbon steel base. Serial# 464/1. Built 1998.